Designed to use the latest generation of low pressure membranes for maximum efficiency, high quality permeate and durability. Full featured microprocessor controller provides a highly stable operating platform. User friendly LCD display shows all operational data including flows, conductivity and pressure when equipped. Stainless steel welded structure for corrosion resistance and enduring appearance. 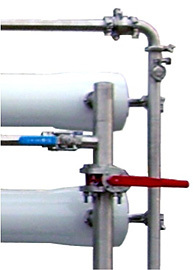 High pressure piping in 316L SS for durability. Isolation/divert valves to facilitate optimum in situ membrane cleaning. Available back-up controls and pump to minimize downtime risk. Available membrane preservation package provides 2X average membrane service life and a 50% reduction in cleaning frequency. Available permeate divert guarantees optimum quality permeate to process. 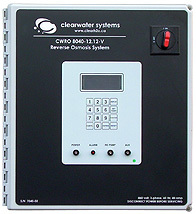 The CWRO 8040 series of advanced reverse osmosis systems is based on the popular 8" x 40" membrane size with permeate flows from 230 L/min (60 US GPM). Systems are available in two basic configurations. The "I" series units are for industrial applications, while machines fabricated to GMP standards bear the "V" designation and are configurable for pharmaceutical, beverage or medical applications. As with all Clearwater Systems, high quality components and innovative design are combined to offer a machine of exceptional reliability and optimum safety. Full instrumentation and controls assure the system's ability to accommodate a wide range of feed waters. Advanced microprocessor based controls provide one of the most stable operating platforms in the industry.